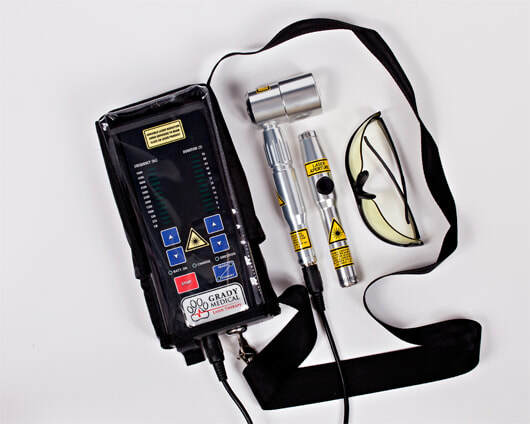 Laser therapy is the application of a coherent light. The laser light consists of multiple light waves in which all of the waves support one another. It is a holistic, non-invasive, effective way to treat and manage a variety of different conditions. The laser beam stimulates the cells and tissue to be healthy. It also reduces inflammation so that healing can begin. By reducing inflammation, the laser is also a great tool for helping minimizing the pain of many chronic conditions, like arthritis. It is a painless application of healing light. Your animal may feel a slight tingling as the light enters the tissue and cells, but it is very minimal if at all. How long and how many treatments? The treatment time depends on how chronic the condition is and the depth the laser light needs to reach to be effective. However, almost all treatments will be between 2-10 minutes. We are not able to guarantee the results on every animal. However, laser therapy has been proven to be effective in clinical studies and in rehab settings in both human and veterinarian medicine. There are over 30 years of research which supports the efficacy of this holistic treatment.